Taking on an exhibition build is no easy feat – and whether you’re outsourcing the work, managing the build on behalf of your clients, or exhibiting yourself, there are several key (and often forgotten) elements of the build to consider, that are crucial for success at any event. Construction is often wrongly thought of as just the building process of the stand; in fact, the construction phase is vital as a rehearsal for your event. It’s an opportunity to discover what works – and what doesn’t – in practice, without having to deal at the same time with the distractions of a live exhibition. Where amendments to the original specification need to be made, they should always be meticulously documented, forming a comprehensive record of any cost variations incurred – and in turn, ensuring greater transparency between client and supplier. 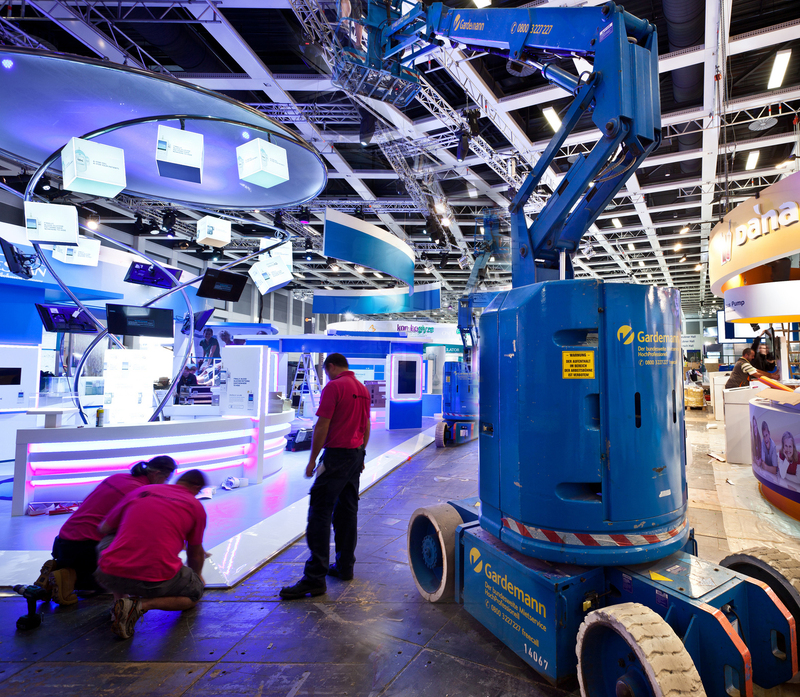 Having an effective and practical quality control system in place is essential for every stage of your exhibition build. Issues are always easier to manage and overcome in advance of your event – and the right system will find any defects in workshop construction, ensure the highest standards are met, and mean that your stand will always be signed off and authorised as a final check before it is transported anywhere. Putting the stand together on the shop floor pre-delivery allows you to test stability, robustness and practicality, as well as increasing efficiency levels when it comes to installation at your event. Not just a case of loading your stand on to a truck and taking it to location, the delivery phase of an exhibition build involves complex logistics and meticulous organisation. What does the stand weigh and what are the dimensions when packed down? What manpower and resources are needed to safely load and unload each element? Does your stand include high-spec technological features that require specific transportation? And how can you account for all manner of possible challenges that might arise during transit including inclement weather, heavy traffic or route diversions? Where possible, it always helps to ensure that the same team members that install your stand are also involved in the construction process. It improves continuity and, in our experience, results in greater efficiency when it comes to the final build in situ. The installation itself doesn’t just comprise the on-site build, but also components such as AV equipment, graphics, artwork and furnishings…think electrical, plumbing, rigging, logistics. Don’t underestimate too the importance of a final deep clean to ensure your stand is immaculate, impressive and ready to go, prior to handover. Exhibition events are chaotic, frenetic and (sometimes) manic, so good communication and effective liaison between the contract manager and site service providers is essential. Implementing ordering protocol, overseeing on-site construction, liaising with exhibition organisers, ensuring necessary build permissions are obtained and that relevant insurances are in place… the proficiency of your on-site liaison can significantly impact on your ability to meet important deadlines, and ensure smooth running throughout your event. In most cases, taking care of an exhibition build also means taking it down. While the excitement of the main event might be over, the de-rig is a key element in the success of an exhibition – and it requires careful planning and execution. Once the visitors are gone, deadlines still need to be met, so it’s imperative your stand is packed down with precision and efficiency. Extra time and costs incurred will impact on the return on your investment and play a part in the overall success of your exhibition stand. If you’d like help and advice regarding an exhibition build, or if you’re looking to outsource work for your clients, just get in touch with the team here at Fernleigh Design, we’d be happy to help.